Today we got to 36 degrees Celsius, yesterday it was 40. We’re into our 2nd week of high 30’s and it’s not even summer – what’s a gal to do? Craft of course! I started writing my Christmas cards yesterday, need to get my US/Canadian cards into the mail if they’re to make it on time and I’m still a few cards short. So off to some challenges I go for inspiration. Up first is a card I’m entering over at Sunday Stamps which is a sketch challenge and SU! Only Challenges which is to create a card celebrating a winter holiday. I’m hoping thinking about winter will make me feel cooler on this hot day. 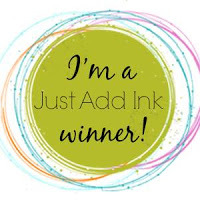 My card uses all Stampin Up products. The sleigh is from a set called Cozy Christmas and the sentiment is from Greetings from Santa. I gold embossed the sleigh and white embossed the sentiment. I then sponged the whisper white panel with lemon lime twist ink and splattered it with some water to simulate snow. the close up shows the sentiment a little bit better. Next up is a card for my daughter’s teacher. Miss K wanted me to make a shaker card, so I die cut the Stampin Up detailed Santa thinlit out of silver glitter paper, popped it up and filled it with green and blue sequins. I’m entering this card into the current Merry Mondays Challenge which is a colour theme and for Less Is More which is all about letting it shine. I was able to make a card this morning before I started work – a perk when I’m able to work from home! Now I must admit that I’m not really feeling the warm and cozy for The Paper Players challenge as we’re having a week of hot weather here as we’re heading into summer but I never can say no to a good cup of java! My twist on the sketch was using the coffee steam as the long vertical panel which I stamped in gold to suit the JUGS color theme and this next picture might show the turquoise, brown and gold colours better. I paper pieced the DSP for the coffee mug and coloured the coffee with the baked brown sugar ink. Author tinstar05Posted on November 21, 2017 9 Comments on Java a great day! I have had one super crazy busy week and really needed to get my craft on and was fortunate that Miss K went to visit her friend today so found myself with plenty of ‘me’ time to play. I made a card for WWC145 – Judy’s Masculine “Anything Goes” Challenge This was a fabulous challenge to participate in, as I struggle making masculine cards and needed some inspiration. My card is a hybrid digital/stamped card. I used an old Stampin Up digital image ‘Extreme surfboard’ that I printed onto a card piece I’d sponged with Stampin Up soft sky and island indigo inks, then added some water drops to simulate the look of the surf. The sentiment is from Altenew ‘Birthday bash’ and the black and white DSP is a left-over piece I had lying around. My next card is inspired by the sketch at Freshly Made Sketches #313 – A Sketch by Karren and uses a stamp set (best in you) and inks (melon ice, lime rickey, grass skirt, tiara, tiki torch, orange twist and black jack) from Catherine Pooler Designs. I followed the Bow/Elegant/Heat Emboss line of the Tic Tac Toe challenge and I really like how this card came out. The bow is made using the Stampin Up Bow maker punch with some white glimmer paper. The aqua piece was sponged with Ranger Peacock feathers distress oxide ink over the heat embossed snow flake from Kanban. I used Stampin Up iridescent ice embossing powder, the close up really shows how much it sparkles. My last card for this long Sunday post is all about circles and I’m entering it into the current Seize the Birthday challenge. I think it might also suit the AAA Cards Celebrate challenge. I ended up making 2 cards using this design, 1 for a birthday and 1 for Christmas.